Renault Megane GT-Line Wagon Premium. WAGONS, believe it or not, continue to garner favour particularly with those drivers who want space and creature comforts but are unwilling to buy into the whole SUV phenomenon. Sculpted new designs have made them sexier than the nondescript tanks which were such a feature of my childhood while a refined performance and top-notch inclusions means that buying a wagon no longer feels like you are settling for second best. 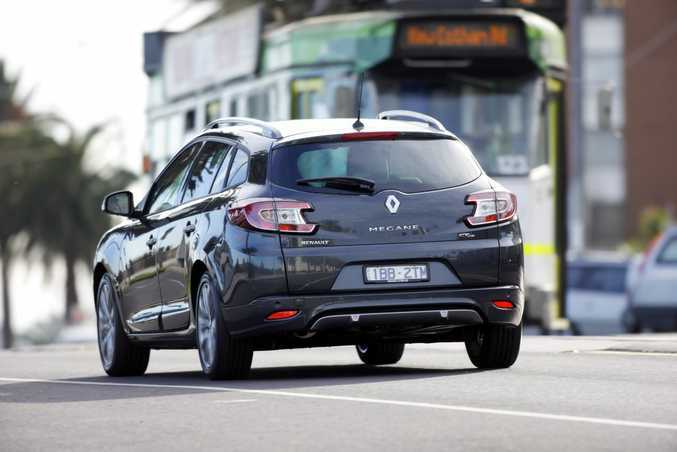 The new Renault GT-Line wagon is not only a clever tactic by the French manufacturer to make an impact in a different market in Australia but is also a keen advertisement for the benefits of a car of this ilk. Inside, the GT-Line wagon is decidedly upbeat with two-tone leather seats and a simple but effective carbon fibre-effect dashboard the main style features. Instruments, with a sporty hue, are easy enough to use and includes a 17.7cm touch-screen with R-Link Enhanced Satellite Navigation which offers a wealth of information. The sporty bucket seats are mostly comforted with the front pair heated if you wish. An on-trend panoramic sunroof lightens things up but compromises head room a bit and, come to think of it, legroom for rear seat passengers is tight too. Storage options dotted around the cabin are more than useful save for the solitary front cup holder that is poorly placed and almost impossible to use. The boot - 524 litres compared to 372L in the hatch - is generous for this class and you can easily carry a mountain bike with the back seats folded flat and a surfboard when the front passenger seat comes to the party. Powered by a 1.5-litre turbo diesel engine paired with a twin-clutch auto, our test car offered a pleasantly sporty ride with little present to offend. Renault Sport has had a hand here with stiffer springs and dampers, a lower front roll centre height (by 30mm) and a lower centre of gravity (by 112mm) which combine to help create a performance and handling that is a nice surprise. The GT wagon holds its line easily around corners, steering is direct with a fair bit of feedback and it is quite nimble when dealing with inner city intricacies. There is no hesitation from standstill and while the twin-clutch transmission never misses a beat under hard braking or on steeper hilly challenges, it does pause momentarily to gather itself when pushed to accelerate quickly. The inclusions in our Premium model left us spoilt for choice boasting among others 17-inch alloys, keyless entry and start, LED running lights, dual-zone climate control, auto headlights and wipers, heated front seats, panoramic sunroof, 17.7cm TomTom sat nav with reverse camera and parking sensors. The Megane GT wagon has a five-star ANCAP rating with anti-lock brakes with electronic brake assist and EBD, traction and stability control, front, front-side and curtain airbags and Renault's Visio system which includes lane departure warning. The main challenge will come from the Hyundai i30 Tourer (from $25,590), Volkswagen Golf wagon (from $26,990), Peugeot 308 wagon (from $35,490), Holden Cruze Sportwagon (from $25,790) and Proton Exora wagon (from $25,990). The 4.5L litres/100km is the extraordinary figure here meaning that more than 1300km on a single tank is a very real possibility. We were closer to 5.2L/100km which is still a lot to crow about. The GT wagon comes with Renault's five-year unlimited kilometre warranty, five-year roadside assist and capped-price servicing for three years. With its compact but elegant shape, sharp sloping lines and prominent Renault badge the Megane GT wagon is certainly a stylish proposition. The unusually shaped headlights and LED running lights add to the appeal. Wagons, even small ones like this, offer a load of options not represented in a hatch or small sedan. Space is obviously a factor and the high opening boot lid and low loading lip makes it easy to load and carry items much bigger than the weekly shop. Having the start-stop button nearer to the radio controls than the driver takes getting used to and the flat credit card key while great in theory is a tad bulky in practice. This clever offering from Renault is a great choice for those that are loath to go down the SUV path but still want some of the advantages that vehicle offers. With a sporty ride, a host of exclusions and a peace-of-mind warranty at a reasonable price the GT wagon is definitely one to consider. What we liked: Sporty drive, value for money and stylish looks. What we'd like to see: Better cup holders, less lag under heavy acceleration and paddle shifters. Warranty and servicing: Five-year unlimited kilometre warranty with capped-price servicing for three years/45,000km. Services are $299, required annually or every 15,000km. Model: Renault Megane GT-Line Wagon Premium. Details: Five-door front-wheel-drive small wagon. Engine: 1.5-litre four-cylinder turbo diesel generating maximum power of 81kW @ 4000rpm and peak torque of 240Nm @ 1750rpm. Transmission: Six-speed dual clutch automatic. Consumption: 4.5 litres/100km (combined average). Bottom line plus on-roads: $34,990 (entry from $30,990). 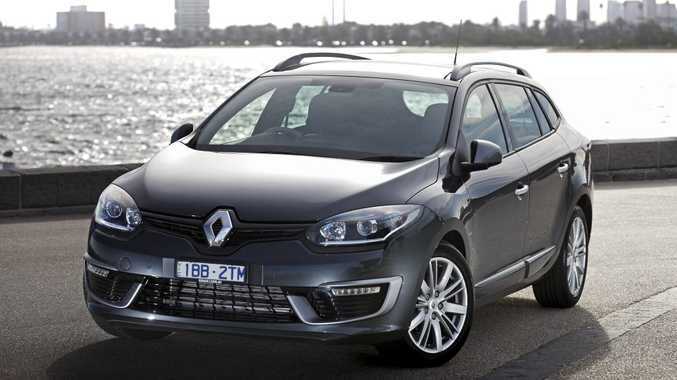 The Renault Megane GT-Line Wagon.